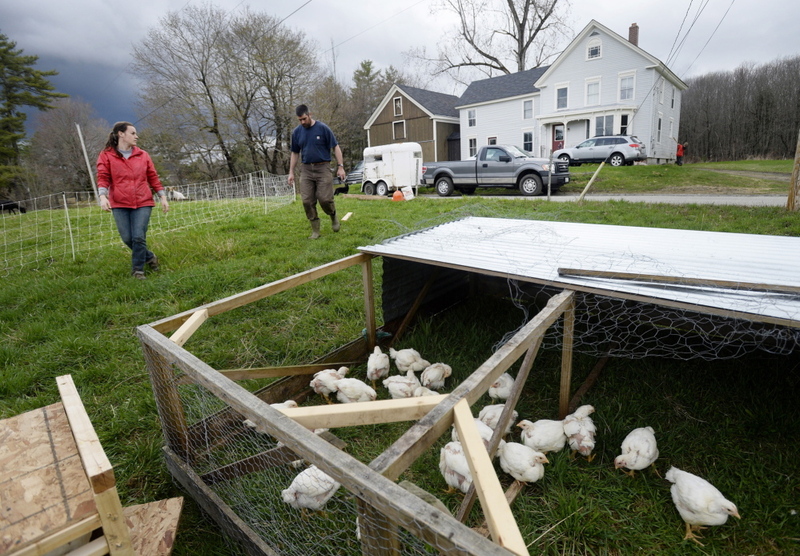 More young people aspire to be farmers, especially in Maine. On moving day, Michael Dennett and Ryan Fahey had a fairly typical late 20-something, early 30-something collection of belongings to transport: secondhand furniture, a carton of flip flops (party favors left over from their wedding last summer) and a pair of rescue dogs, one relaxed and enjoying the spring day, the other too agitated to be let loose. Much less typical, the couple was traveling with livestock: 12 pigs (three of them pregnant), 17 sheep and 140 chickens. Amend that – 140 broilers and laying hens left Bremen, where Dennett and Fahey had been living and farming for nearly three years on the shores of Biscay Pond. By the time they arrived at Oaklands Farm in Gardiner, where the couple is entering into a leasing arrangement with older, more experienced farmers, one of the broilers looked profoundly wilted from its journey. Dennett walked off toward the barn to dispatch the ailing chicken while the sheep explored the perimeters of their new pen on lush, green grass. The Cornish Cross birds pecked at the grain Fahey had just poured into the chicken tractor. Meanwhile Gus, the nervous dog, barked from inside the house. Gus has found his “forever home” with the Dennett-Fahey household, but his owners, like many of Maine’s young farmers, are technically still in search of theirs. It could be Oaklands Farm – and they’d be thrilled if it were – but it might not be. They’ve been in limbo since they decided together to farm, and that’s where the couple will likely remain for at least the first year of this new arrangement. At 31 and 29 respectively, Dennett and Fahey are representative of Maine’s boomlet of farmers, the 25-to-34 demographic that experienced a 40 percent increase between the United State’s Department of Agriculture 2007 and 2012 Farm Census (nationally the number of young farmers was also on the rise, up 11.3 percent). That jump is good news for Mainers who care about the future of farming – the average age of an American farmer is 58. But that youthful farming demographic faces a unique set of challenges; they’re often farmers in search of farms. While they browse the listings at real estate companies or postings at Maine Farmland Trust, which helps pair farms for sale with beginning farmers through its FarmLink program, these aspiring farmers lease land, live in borrowed or rented housing and sometimes, as the Dennett-Faheys are doing by sharing property with Logan Johnston, 61, and Phyllis Gardiner, 59, enter into a very intimate kind of internship with mentors from another generation. give up the old paradigm. “You have to divorce yourself from the romantic notion of owning the land,” says farmer Stacy Brenner. She’s in her 40s now and has been farming for 13 years, eight of them at Broadturn Farm in Scarborough, on land she and her partner John Bliss lease through the Scarborough Land Trust. When Dennett and Fahey, who went to the same high school in York County, started dating some eight years ago, they were living in Kittery. Fahey floated the idea of a shared future homesteading or farming. “I just remember thinking, ‘No way,’” Dennett said with a laugh. Then he started reading about Helen and Scott Nearing, the original back to the landers, and Eliot Coleman, the Nearing’s protégé. He was seduced. On a partly sunny May day, shortly after the big move, Dennett was lecturing on probability to his class at Thomaston Grammar School, where he teaches four sections of science and one of math. The students were mostly seventh-graders, with a few advanced sixth-graders mixed in. Hanging on the chair behind his desk was a vest emblazoned with the emblem of Crescent Run Farm, the business that ultimately sprang from that first summer of messing around with vegetables. There were a few experiments going on the windowsill, one involving eggs and the matter of permeability, the others plants: sprouting corn and a random radish. The farm theme was even woven into the lesson on area models and calculating probability, which used the example of different colored socks. “I have farm socks and I have school socks,” Dennett said as he walked around the room. “They’re short and long and they get mixed up. Socks are a pain.” He’s tall. In the parlance of Laura Ingalls Wilder, Dennett would definitely be described as “strapping.” He’s also the guy who Fahey says she has to prod to move along during chores; the animals are that appealing. “Michael loves the lambs,” she said. The camaraderie with his students was easy, relaxed and resoundingly fond – going both ways. “Can we do partnership?” one of the kids asked, asking if they could all break into smaller groups and work on the problem together. “Why, are you feeling lazy?” Dennett teased. Maybe he was born to be a teacher. But with Fahey as his original catalyst and partner, he’s also made himself into a farmer. While his students dispersed, iPads in hand, he admitted to being tired. Blending the careers of farming and teaching is generally a good thing, what with the summers off. But throw a big move in there, heading into finals and end-of-the-school-year projects? Grueling. “Ryan and I have been working until 9 at night for basically 20 days in a row,” he said. He look tired. But a good sort of tired. Happy, satisfied. Dennett and Fahey explored all avenues in their search for land, including working with a real estate agent, coordinating with the Maine Organic Farmers and Growers Association (MOFGA) and signing up for Maine Farmland Trust’s FarmLink program. Maine Farmland Trust has been connecting farms and beginning farmers, not all of them young, through FarmLink since 2002, and has made 105 matches in that time, some actual sales, others leasing arrangements. Typically there are more seekers than sellers in their database (about half of these properties are also posted commercially). In May, there were 242 individuals or families looking for farms, and 142 Maine farms up for grab, far more of them in central or Southern Maine than say, Aroostook County. Some people have been in the program for years, looking for just the right match. Like Kathi Langelier, 38, a small-time farmer who specializes in growing herbs for herbal teas. She’s been making do with a one-acre patch on a rental property in Lincolnville for four growing seasons and longs for a 20-acre farm with 10 acres of tillable land and 10 acres of woodlot. But in two years of searching, she’s come close to making an offer only twice. And both times, most recently in April, those dreamy farms were sold to someone else. Does that sound like your love life? The process is actually so much like dating that Maine Farmland Trust has been known to hold “Speed-Linking” events. Earlier this month the Benton Grange was the site of just such an event, with prospective buyers, leasers and sellers spending three and a half minutes in conversations, then moving along to the next table. Instead of a buzzer alerting everyone it was time to move on to the next candidate, “I rang a cowbell,” said Ellen Sabina, the outreach director for Maine Farmland Trust. The Maine Organic Farmers and Growers Association works in partnership with FarmLink and Land for Good, a New Hampshire-based nonprofit, to help pair land with farmers. Wiscasset-based CEI, a nonprofit that specializes in rural development, also offers advice (Langelier has been working with a CEI counselor recently). Sabina said most seekers take advantage of every outlet, including Craig’s List. But bringing people together in a room for a Speed-Linking event attempts to bring back some old ways, when farmers of different generations mingled at Grange suppers and shared information about whose land was available and for what price. When she’s driving around the state, Langelier sees former farmland lying fallow. Maybe it’s owned by summer people. Or maybe one farm failed and the place is in transition. It’s a steady source of temptation. “You just see a lot of land just sitting,” she said. John Piotti, the president and CEO of Maine Farmland Trust, is well aware of that paradox. He points out that while the 2012 census shows 1.455 million acres of land in Maine are being farmed, only 700,000 acres are what we technically called cultivated; the rest are simply under farm ownership. At the turn of the century, there were 6.5 million acres of farmland. “What happen to the other 5.8 million?”Piotti asked. Like Langelier, he sees potential everywhere, although not just for 10 acres to grow herbs on, but for farms enough to match all the young people with plans. And not just in the rolling pasture land so many of us think equate with farms. Piotti wants to see future farms looking to Maine’s woods as well, where pigs like Dennett and Fahey’s might graze, or mushrooms can be cultivated and stone fruit or apple trees could be mixed in with maples and firs. The lack of affordable land is a big problem. So is being able to finance the purchase of land that will yield slim profit margins of say, 3 to 4 percent. A good business plan is key. But still, it is a struggle. “For every 10, we might be able to help one of them,” Piotti said. There are no set answers for beginning farmers, he said. Well maybe a few. “If you live in an area like Scarborough, there’s not really an option to buy unless you win the lottery,” he said. But there are strategies to get around the high price of real estate. “Leasing is increasingly viewed as a viable option,” he said. And it’s good for a lot of people, as long as it is a longer-term arrangement, like say, a 30 year-lease, he said. The danger in the short-term lease is that beginning farmers pour their energy and enthusiasm into improving land, with the risk that their landlords might pull the rug out from under them. But an opportunity like the one Dennett and Fahey have at Oaklands Farm carries with it the promise of long-term stability – provided it works for the four parties involved. It took the animals hours to acclimate; with humans it is a little harder. Dennett and Fahey lived for nearly three years rent-free in a small apartment set on a hilly, rocky piece of property in Bremen owned by philanthropist Eleanor Kinney. Kinney is a member of Slow Money Maine and founder of No Small Potatoes, an investment club that provides loans to farmers and food producers. She was interested in returning her lakeside property, a sheep farm in the 1950s, into agriculture use and found Dennett and Fahey through Maine Farmland Trust. It felt, right away, like “a good fit,” she said. She offered the young couple a debt-free landing pad to gain the business experience they thought might get them a mortgage through the Farm Service Agency. In exchange, they grew produce for the family, raised laying hens, produced meat and gave her three children a close-up look at farming. Virtually the whole time they lived on Kinney’s property, during the hours when they weren’t taking courses through MOFGA’s Journeyperson program, discovering a love of pigs and lambs or starting a brand new farmers market in nearby Thomaston, Dennett and Fahey were searching for something more permanent. They’d outgrown Kinney’s place, growing vegetables on a piece of land four miles away, and moving their flock of sheep to a pasture elsewhere. It’s hard not to feel a little on the spot when you’re essentially living with a family who has to walk by your windows to get their mail. “It’s pretty intimate,” Dennett said. “There were some huge adjustments and you have to be flexible. It hasn’t always been a walk in the park, but overall it is has been extremely positive.” They got married on Kinney’s land last summer. Her kids named their pigs. Ringo the boar. Ronnie the sow. The question kept nagging at them all through – what next? Then in January, a new possibility opened up. MOFGA’s New Farmer Programs Coordinator Abby Sadauckas introduced Dennett and Fahey to Johnston and Gardiner, who were looking for something very specific: young farmers willing to invest in something they could never own. Johnston and Gardiner farm a beautiful 110-acres that even they don’t technically own because the land is in trust, in part to protect it from the kind of farming failure that could turn rolling fields into say, a housing development. And the older couple needs help. The four of them walked Oaklands Farm together. They emailed. They talked. Farming together is a business arrangement, yes, but also an emotional one, and not an easy one to enter into. Jo Barrett, the Maine Field Agent for New Hampshire-based Land for Good, which helps pair farmers with land, served as a mediator, to help them talk through any awkwardness. “It has to work,” Johnston acknowledged. This land, Gardiner land for coming on three centuries, has had many stewards and many chapters in its long history. It needs new ones. A new chapter, Johnston says. On Dennett and Fahey’s big moving day, Johnston stood in a pasture and recounted some of those past chapters. The first Gardiners arrived in the lush region on the banks of the Kennebec in the mid-18th century, running mills of all varieties (saw, felting, grist); farming has long been part of the family tradition. In the 1980s, Phyllis Gardiner’s father established a family trust for Oaklands Farm. Johnston and Gardiner, whose day job is as an assistant attorney general, took up the farming mantle in 1990, making the decision to shut down a failing dairy. Area farms were disappearing rapidly. They crunched numbers. “We spent a lot of time wondering, what do we do?” Johnston said. Haying and beef cattle – added in 2000 – seemed the solution to sustaining the 110-acre farm. Johnston grew up in Los Angeles and worked for the publisher Little, Brown and Company in Boston. Now he’s the treasurer of MOFGA, puts up the equivalent of 5,000 square bales of hay a year and can proudly point to the fact that the nearby A 1 Diner, a local mainstay, serves up an Oaklands Farm burger. But two and a half decades later, Johnston and Gardiner are ready to begin the next transition. For the last five years they’ve been looking for someone to take over the bulk of the farming operation. Their son, a recent college graduate, or one of his many cousins may eventually want to farm, too, and the trust allows for that flexibility. But for now, these farmers, just a few years older than the average Maine farmer (57) according to the last census, could use some help. “We want someone who will love the place as much as we do,” Johnston said. The sticking point is that they can’t transfer ownership; the family trust prevents it. Oaklands Farm can’t be bought or sold, or turned into a development, for which Johnston is deeply grateful. But how to keep the farm going? “A lot of people said, if we can’t own it, we don’t want it,” Johnston said. But to live on a vast property, stretching almost to the banks of the Kennebec, where the pigs and sheep and cattle and chickens can share the land? It was seriously tempting to Dennett and Fahey. They’ll pay rent on the Victorian farmhouse they just moved into – there are several houses on the property, including the original Robert Gardiner stone building overlooking the river – and if all goes well, they may be able to purchase the house later. They’ll be paid for the labor they do on the farm, including the haying and caring for the beef cattle. They’ll sell the Oaklands Farm branded beef at both the Thomaston and Gardiner farmers markets. They’ll learn new aspects of farming, while growing that flock of sheep, breeding more pigs and expanding the broiler and egg business. They might not be land owners, and maybe never, but they are on the land. He watched as Dennett drove the trailer containing the last few pigs down to the pen and negotiated backing it up to the movable fencing.